About four years ago, the citizens of the Town of York approved a Sohier Park Master Plan that will significantly beautify the park and make it into a more friendly area for visitors to come to and enjoy. 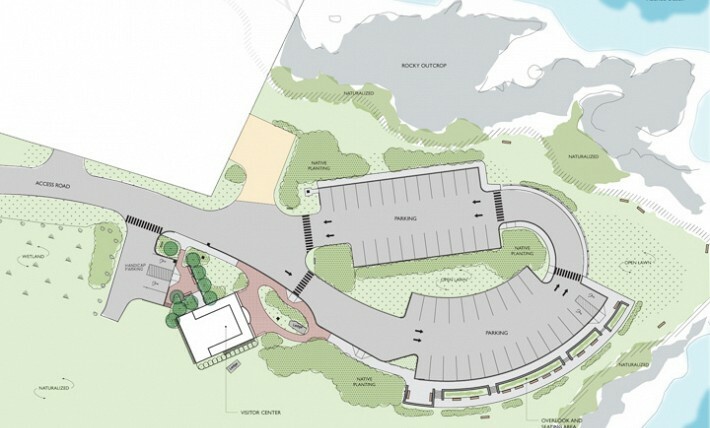 It calls for major changes in the parking areas that will better facilitate the visitors’ opportunities for better enjoyment of viewing the Nubble Lighthouse and for better pictures of this majestic sight. Under the Parks & Recreation auspicies, a fund-raising endeavor was being put together to blanket all opportunities for seeking out donations. However, the significant downturn in the national and local economies quickly dispelled any notion that a widespread fund-raising endeavor could be undertaken. Consequently, we stopped and awaited an upswing in the local and national economies to again undertake this mission. As of October 2012, we’ve not felt it appropriate to start just yet with the economic outlooks being as they are. To achieve this Master Plan’s rendition of change and beautification, we felt more than $1 million is required. The expansion of the existing Welcome Center & Gift Shop (and connected bathrooms) is essential to our future. The 12′ x 12′ merchandising area is simply too small to accommodate the ever-increasing flow of visitors to our park. Many of our visitors cannot visit the shop because its simply overflowing with people. The conditions inside the shop are barely tolerable when faced with such crowds. As a matter of safety and accommodation to our visitors, the gift shop portion needs to be expanded into a 450′ square foot area. A major part of this expansion is the upgrading of our bathroom facilities which have been in place since 1991 without modification. They are barely functional and generally overcrowded on the ladies’ side especially. Therefore, we are doubling the size of the ladies’ side and significantly upgrading both sides to better serve our visitors and workers. We regularly are visited by hundreds of bus loads of touring visitors for which we are grateful, but we need improved facilities to better service their needs as well. We have super-imposed the expanded Welcome Center & Gift Shop onto the Sohier Park Master Plan schematics to clarify the plan itself. Hopefully, after we have constructed the expanded facilities, the economy may improve so that we can undertake a major fund-raising endeavor on behalf of implementing the Sohier Park Master Plan in the future.